Demi Lovato is a child star creation of the Disney Corporation. In 1999 and 2000, she appeared as "Angela" on the children's television program Barney, and in 2007 Disney cast her to appear in a handful of episodes of the 5-minute-long "microseries", As the Bell Rings. In 2008, she was the lead in the Disney Channel movie, Camp Rock, a formulaic and poorly executed story of a girl who wants to attend a Rock and Roll camp. Her second movie, Princess Protection Program (2009), is slightly better but never escapes mediocrity. Lovato's acting talents are best visible in Sonny with a Chance, perhaps one of the better sitcoms on the Disney Channel. But that is a very low bar. Overall, she has fared well as a singer, with three tracks from her 2008 album, Don't Forget, making the Billboard 100. 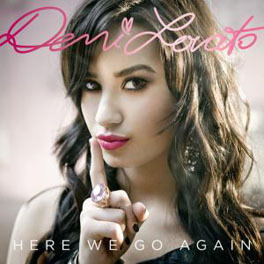 Her second album, 2009's Here We Go Again, was even more successful, debuting at at the top of the Billboard 200. A sequel to Camp Rock appeared in 2010. Explaining a tattoo on her hand, video interview, July 2011: "Every time I hold a microphone, you're going to see a cross. I'm pretty spiritual, I'm a very spiritual person and I believe in God and I'm a Christian so I figured what better way than to put it where you are going to see it when I'm holding a mic." It should be noted that tattoos are explicitly prohibited by scripture, an irony visible in Leviticus 19:28.